Last up in my Johnny Cash American series reviews is the fifth of the bunch, A Hundred Highways. As I had said earlier, I already had the original pressings of IV and VI, so I won't be writing about them, but adding V to the collection gives me the complete set of six. Like all of the other Johnny Cash reissues, this one sounds fantastic. They did a great job of presenting these songs in the best possible light and I really recommend anyone who is a fan to grab them. They've actually done a box set of all six that I probably should have tried to get. I just figured since I already had two of them why buy them again, but it would have been worth it to have that nice set in the collection. Musically, it's hard to talk too much about this record with any sort of perspective. It was the first of two American albums to come out after Johnny Cash had died. He sounds weak in some of these songs and there is definitely a mood over the record that is hard to pin down. 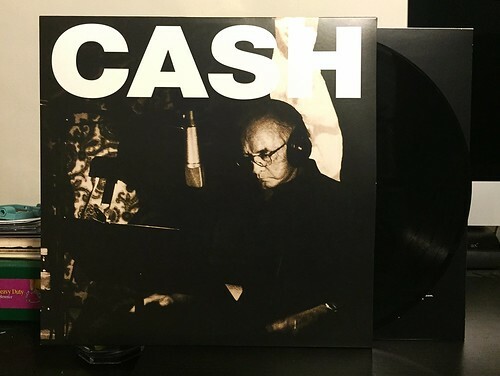 Despite any frailties due to age or illness, Cash is still a master of presenting songs and making them his. While I don't think this is my favorite of the bunch, it's still an amazing assortment of incredible songs. I love the six Johnny Cash American records. It's what opened the door to his music for me. I've spent a fair amount of time going backwards and listening to his older albums as well and he was just a once in a lifetime performer. I'm hopeful at some point they decide to put out the Unearthed box set on vinyl as well. It deserves as respectful of a treatment as these LPs have received.